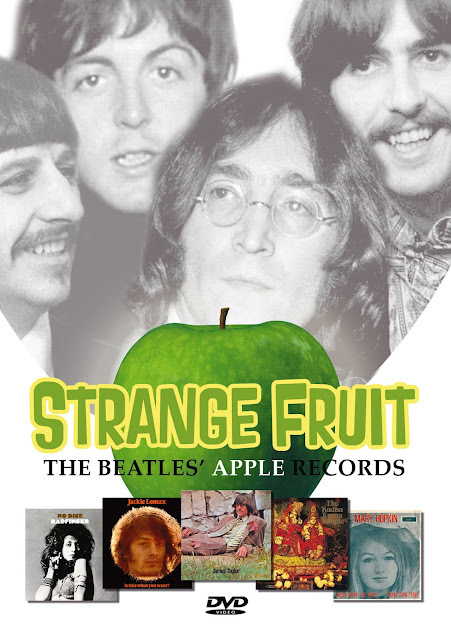 "Strange Fruit: The Beatles' Apple Records"
In 1968, under a haze of publicity, The Beatles opened their collective door to all manner of musicians, writers, artists, film-makers, inventors, designers, freaks and more than a fair share of opportunist sharks. But, despite a hefty investment, little of substance was forthcoming from these assorted misfits outside of the music that emerged from one division of the potential empire; Apple Records. Even discounting those Apple platters that featured as artist the collective or individual names of the company's bosses, music that stands the test of time superbly was released under the stamp of this enterprise. Music which remains available still and both popular and exciting more than 40 years after the majority of it was produced. Strange Fruit- The Beatles' Apple Records is the story of a record label which came to exist under extraordinary circumstances, produced extraordinary records and was operated under extraordinary guidelines. Featuring new interviews with former label M.D. Tony Bramwell, members of Badfinger, The Iveys and Elephant's Memory, Jackie Lomax, Brute Force and David Peel, plus musician and Beatles expert Chris Ingham, author and journalist Mark Paytress and Apple biographer Stefan Granados. Enter here for your chance to win (list price $19.95). Like ChiIL Live Shows on Facebook and/or follow us by e-mail (side bar to the right) for the first heads up on give aways, free downloads, tour news, original band interviews, original pit photos, and more. *Wait for Rafflecopter to load up right here (if you've gone through RSS feed or are scrolling down the blog and don't see it, click on the actual page title and it should pop right up). Enter like we vote in Chi, IL...early and often. Winning rocks! Entries accepted through midnight on 9/14/12. Winner will be announced on the 15th. Thanks to MVD for providing a review copy and a give away copy.